> Knowledge base> Article: Print Head Jammed error message displayed in PTStatus2000 software (LX2000). Remove power from the printer. Disconnect USB and Ethernet. Wait 1 minute. If cartridges are not already installed in the printer, open the cover and install the cartridges. Power on the printer. The error should disappear. Update firmware. Click on the info icon and select the "Check for updates now" button. Check for any obstructions in the print head path such as jammed label material. Check for ink droplets or debris on the encoder strip. This may prohibit movement of the print head. The encoder strip is the clear plastic strip near the back of the print head which spans the print area. There are tiny lines printed on it which the print head carrier uses to gauge its position. Re-grease the metal carrier shaft on which the print head moves. A small amount of White Lithium grease should be used. The maintenance cap may be stuck in the capped/up position. Power off the printer before attempting this procedure. 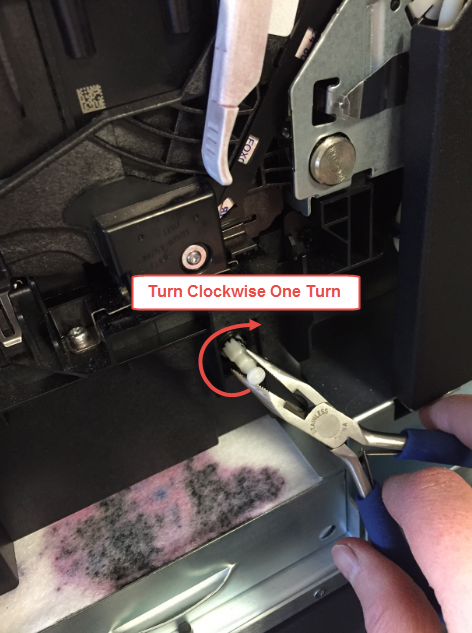 Rotate the white knob on the right side of the printer one turn to manually retract the maintenance cap. Once the cap is released, moved the print head to the far left. Power on the printer. See picture below.